In a world where people are becoming more aware of the inequities half the population faces, Allisonville Christian Church’s Art @ Allisonville drama program is a little ahead of the curve. In his search for a play with a strong female cast, the program’s director Steve Caress ended up commissioning a new play, The Daughters of Z, that will debut at the Indianapolis-area congregation April 27-29, 2018. 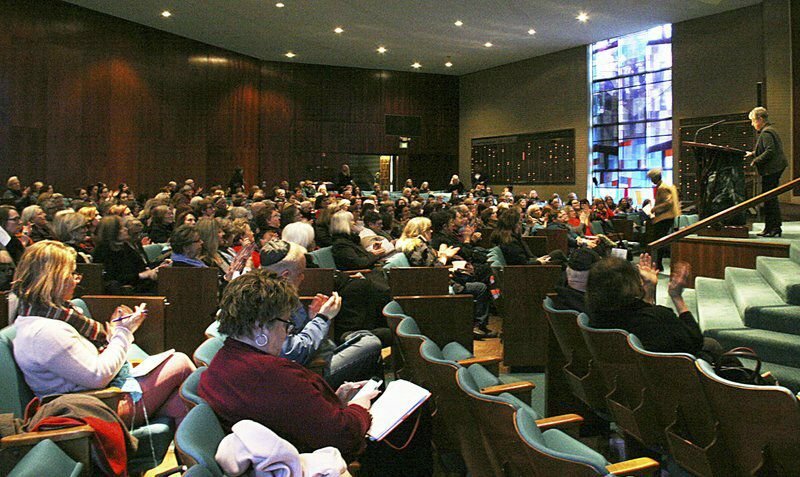 Caress met with several women leaders at Allisonville in his search for the right story to tell, which led him to read works by Rabbi Sandy Eisenberg Sasso (a local religious leaders and children’s book author). Sasso’s story is taken from the book of Numbers and features the daughters of Zelophehad, who had to petition to inherit their father’s wealth since there were no male heirs. The playwright for Allisonville’s interpretation is Georgeanna Smith Wade and the music is composed by Stephanie Grace Caress. If you would like to produce the show in your area, or learn more about 5Z Productions, contact Caress. Boy Scouts make three pledges: duty to God and country, to other people and to self. Duty to self, defined by U.S. Scouting, involves living a life of honesty, being clean in speech and action, and being a person of strong character. Scouts value good citizenship, integrity and compassion. So much for encouraging engagement in good government and service to country. Instead of encouraging respect of past leaders of state who have served our country, he mocked President Barack Obama and criticized Secretary of State Hillary Clinton. Instead of presenting life models of courage and dignity, he spoke of a rich friend who bought a yacht and “had a very interesting life.” Trump went on to explain, “I won’t go any more than that, because you’re Boy Scouts, so I’m not going to tell you what he did (in it). Should I tell you? Should I tell you? You’re Boy Scouts, but you know life. You know life.” So much for thoughtful wisdom for pubescent boys and respect for women. Instead of nurturing inclusivity and respect for diversity of religious faiths, he said, “And, by the way, under the Trump administration you’ll be saying, ‘Merry Christmas’ again when you go shopping.” So much for remembering that the Christmas message is not about consumerism and acknowledging that Scouts come from many religions and celebrate different sacred days. Days after the Scout speech, Trump tweeted that he would no longer allow transgender individuals to serve in the military. He must have forgotten that the new policy of the Boy Scouts is more enlightened. It accepts transgender boys. Whoever has the honor of speaking to young people should know better than to boast, denigrate and demean. The charge is to challenge, encourage and inspire. The messages that our youth receive on a daily basis are: “What you have is never enough.” “Keep nagging and you will get what you want.” “Fit in at all costs.” “How you look matters more than who you are.” Young people need adults who counter those messages. Be strong, but remember that strength has nothing to do with physical prowess or bravado. The greatest signs of strength are self-control and resilience. It takes a strong person to be gentle. Bullies are not strong; they’re afraid. Be careful what you do with your words. You can use them to tear people down or to lift them up. It is easier to attack people than to inspire them. Choose respect over disparagement. Be kind. Life sometimes leads us to cynicism. Bad experiences, mean people and unfortunate luck can make you angry or compassionate. Remember, both graciousness and hate have the power to change the world. You can choose what you want your legacy to be. Young people are impressionable. They deserve to be inspired so that they might aspire; to be challenged so that they might achieve; to hope so that they might flourish. Our president missed the opportunity. Sasso is rabbi emeritus of Congregation Beth-El Zedeck and director of the Religion, Spirituality and the Arts Initiative at Butler University. A few years ago we needed to redo our basement after a fire caused significant damage. We engaged in the unpleasant task of removing the furniture and putting everything else in boxes, which were appropriately labeled. The floor was replaced and new drywall was installed. The restoration work was finally completed. Slowly, we began emptying the boxes and putting items in their proper places. Actually, we did not empty all of the boxes. We made a conscious decision to leave some of them unopened, thinking that if we ever moved to a smaller place, we could get rid of these. To treat health care solely as a bottom line, consumer driven product and not also as a moral mandate is to demean the covenant of citizenship. What if government were prepared to allow 24 million people to lose their health care coverage over the next 10 years? What if people were told that if you had catastrophic illness, it was your problem alone, and that a nation had no collective responsibility to the welfare and care of its citizens? The White House’s proposed budget for 2018 would eliminate funding for the National Endowment for the Arts and the National Endowment for the Humanities. This exclusion will make barely a dent in federal spending. The NEH and NEA receive only .001 percent of a nearly $4 trillion budget. Compare the estimated cost of $38 billion required for a border wall between Mexico and the United States with the $148 million that supports the arts and humanities. The administration is making a statement about what it is we value as a nation. GREENFIELD — Arms outstretched, she falls. The woman depicted in artist Cagney King’s work “Fall from Grace” is a light spot on the canvas. King created the work at her studio in the Creative Arts and Event Center in downtown Greenfield, with texts of the creation narrative as a starting point.